Smiles all around at our Carousel Dance. 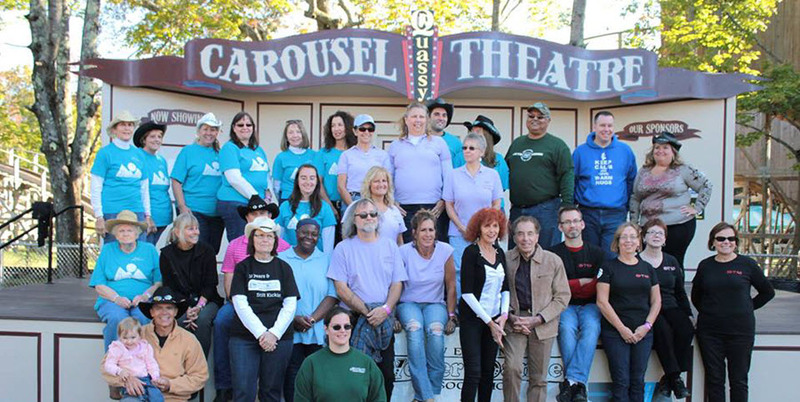 In addition to dancing many rode the Carousel including our President Lynne. We also had some younger non-members who attended. The Carousel Museum brought out new dancers and non-dancers. The age range was fantastic at this dance and everyone was smiling. Thanks to our DJ Dennis and our Instructor Tammy the dancers were out on the beautiful wood floor all the time and had lots of room to dance. And last but not least a very big thank you to Joanne L., Paula F., Mike G., Lynne F., Barbara P., Ann S., Millie G. and other people for donating to our dessert table. Also thanks to Barbara P., Mike G., Lynne F., Paula F., and Millie G. for Raffle/Door Prizes donations. Another successful dance was held on March 17th. Thank you for the Raffle Donations. The green St. Patrick’s Day table held lots of donations and as you can see everyone got in the spirit of the day. Thanks to Joanne L., Lynn J. and Lynne F. and anyone else who did not put their name on the donation list for their donations. It was great to have Lynne Flanders back on the dance floor teaching. Lynne taught “Back in the Day” choreographed by Dan Albro to music by same by Jessta James. We extend a big Welcome to DJ Matt Collins as this was his first time DJing for NEWDA and he got rave reviews. The March 3rd fun dance afternoon was delightful. Thank you Aric for being our DJ and for the “5 minute teach” at the beginning of the dance. Thank you to Lynne F., Aric L., Sheryl M., Lynn J., Joanne L., Barb P., Charlene W. and Margaret P. for the great raffle prizes. The dessert table was tempting thanks to Lynne F, Lynn J, Barb P, Joanne L, Eileen G, Charlene W, Ginny M, Anna Marie L, Tammy & Sharon R.
NEWDA thanks Jill Kaufman Weiss (& Fat City), Aric Lemieux & Sheryl Martin, Char Williams and Lynne Flanders for their donations to our raffle & dessert tables. Your support of our club is greatly appreciated. The Feb. 2nd dance was a huge success! Thank You to Peggy, Joanne, Lynn, Marilu, Sharon, Lynne & Barbara including everyone who did not leave their name for donations to our raffle. Thank you also to all who bought raffle tickets and congratulations to the winners. The 1st Dance of the Year was a Huge Success!! Thank You to everyone who brought goodies for the food table. We had enough food to “feed an army” as the saying goes. Also a big thank you to Sharon, Eileen, Lynne, Joanne, Rhonda & Phil and the rest of you who did not sign the raffle donation sheet but contributed so many raffle (teacup auction) prizes. Wow, there were more members at this dance than there have been for a long time. Thanks to all who came and danced to Mike Germon’s music. For those paying attention to the photo….no those are not Mike’s crutches, they belong to Dan (look back under “Sunshine” for more info). As always a big THANKS to Nicole for the decorations on our St. Patrick’s Day theme. The color green was prevalent throughout the night. You can see all different shades of green on the dancers. As always a big Thank You to all who donated to the refreshment table and helped serve the goodies. With another Thank You to Margaret P., Sharon P., Carol Z and Paula B. for donating to the raffle. The club could not run as smoothly without all the help from it’s members. Thank You to Sharon Haggart for teaching “Baby Didn’t I” that was choreographed by John Robinson. Music “Didn’t I” by James Wesley. Everyone seemed to have it at the end of the teach and many came out on the floor to do it again later on in the night. http://www.mrshowcase.net/BabyDidn’tI.pdf for the step sheet. Aric had everyone dancing all night long. He even joined the dancers for some songs and then dashed back up into the DJ booth. These dedicated dancers continued to dance after most went out to get refreshments at the break. THANK YOU to all who donated the refreshments. There was a big variety and all were delicious. New Year Dance on January 7th. The New Year began with noisemakers and lots of fun for a great crowd. Thank you Nicole for the table decorations.